So, it seems your manager has assigned you your first project and wants to see a project schedule! You don’t have much time as he wants to see it in the next meeting. Your desktop is enhanced with the installation of Microsoft Project and you are ready to start your first project schedule template creation. But unfortunately you don’t know much about it and your boss is expecting a full schedule within a week’s time. No need to worry as this article will be able to let you complete your assigned task in the given time frame. This step is the primary step with the goal of identifying all the tasks encompassing the accomplishment of the project. This often results in identifying all the work products and deliverables that build the whole project. These deliverables are usually known as the components of a WBS- Work Breakdown Structure. The schedule of the project further breaks down these deliverables into the actual tasks that complete the work. If the team is not provided with a proper scope statement, the entire work breakdown structure or sufficient scope definition, then workshops will be required to gather the actual requirements and further enhance the project schedule. You don’t have much time and so you will have to create tasks in your free schedule template for clear breakdown of the “Project Analysis” or “Project Scope Definition”. At this point it is feasible to not have all the project details in hand, however you can gather information by building activities in your project schedule. It is totally justified to build a plan for the project analysis before making a commitment to implement or deliver a phase of the project. At this point you can assume that you either have a work breakdown schedule or have enough information to create a sample set of tasks so that the scope if defined further. Once all the activities are defined, the next step is to develop a sequence of the activities. Now that you have listed the tasks and have further broken down the deliverables listed inthe work breakdown structure, the next step involves sequencing the activities with dependencies. In this step, you will certainly list down all the dependencies of tasks involved and document them in the final project schedule template sample. Analyze each task to understand which task has a greater degree of dependency on additional tasks. If you are following a project schedule development book, then make sure go through the varied dependency relationships including finish-to-start and start-to-start dependencies. These relationships will effect task ending and starting dates. Thirdly, you have to identify the resources required for the project execution and their availability before the project is executed. Not all team members listed down will be available 100 percent of the time as most of the members will be multitasking in the same project. Therefore it is very important to assign resources to each of the tasks. 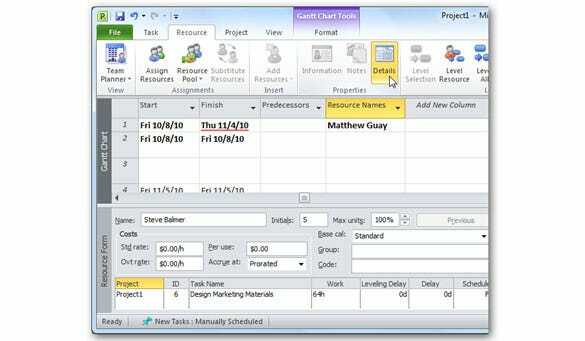 Usually the standard Gantt chartis utilized to complete this step in Microsoft Project. 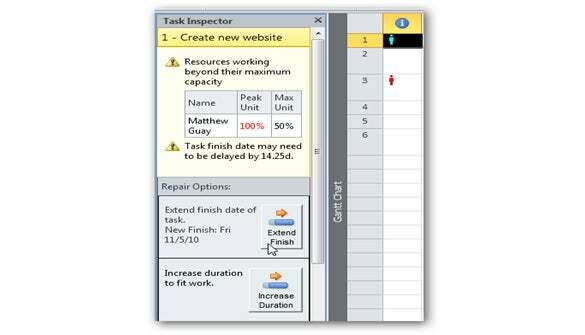 Starting from the lowest point in the WBS, for each task click on the drop down menu in the Resource Names column and assign the available team member. It is highly recommended that the tasks are broken down for assigning to individual tasks as compared to multiple resource assignment for multiple tasks. Though it creates a larger schedule, but it helps in better control of allocation and resource tracking for the project execution. Once you have assigned the resources, the next step is to identify the duration of each task. The duration is defined as the total number of periods required to achieve the task. In Microsoft Project, these periods can be given in terms of days, weeks, and months depending on the complexity of the project. It is extremely important to learn the difference of the various types of durations including Fixed Work, Fixed Duration and Fixed Units. The type of duration selected impacts the availability of the resource and the task end date forecasted. The last step is scrutinize the project schedule sample in terms of the defined sequences, durations, resources and limitations. The purpose of this step is to realize the validity of the project schedule and whether the project will be executed properly. This step is not just limited to defining the duration and accuracy but also the validity of the resource allocations. Levelling the resourcesis a key step to make sure the project dates defined are achievable realistically or not and whether the resources are assigned appropriately. Microsoft Project has an automatic feature to level out resource allocation, but it is recommended not to use it since manual resource levelling further helps in resolving the issue of over-allocation of resources. 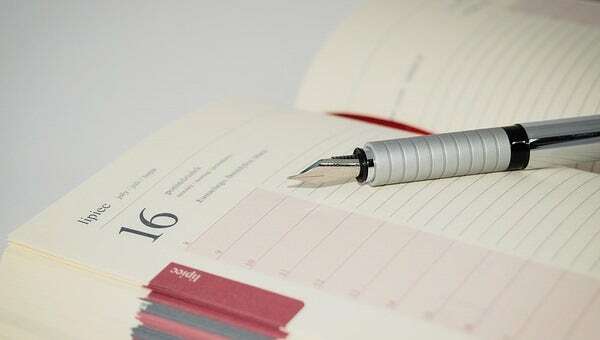 This manual process however is time consuming, but gives better results in terms of end project with realistic dates. Once the schedule is developed as per the steps defined, you are all ready to review this with your manager for initial feedback. Once the manager’s feedback is obtained you can necessary changes if required. You will have to baseline the schedule before it is executed. This will help ensure that the project dates are saved in Microsoft Project and the planned dates are compared with the actual dates once the project is executed. It is not right to build a schedule on the basis of tasks as a scheduler cannot identify if a stakeholder change falls within the project scope. Project schedules are much better if built around deliverables because they are tangible, can be verified and must meet standards predetermined to complete the project. Executing and controlling the schedule template word based on the plan along with the responsibilities.